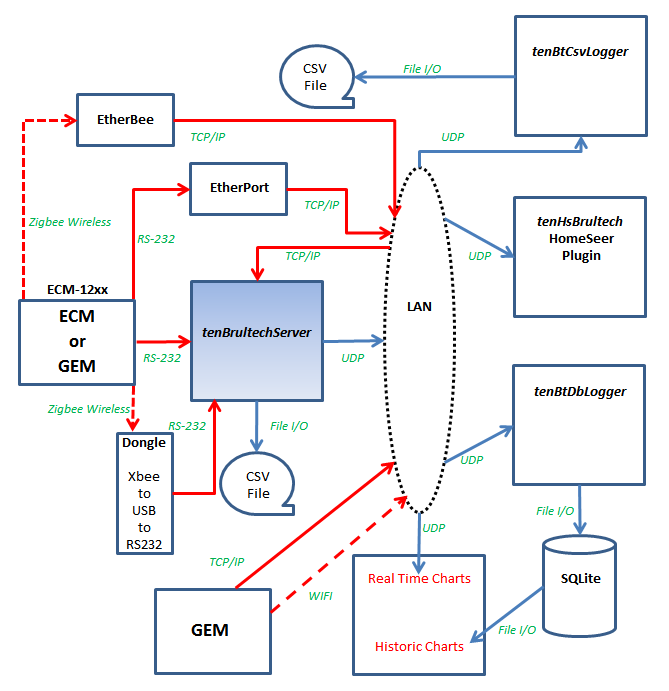 tenBrultechServer connects to one or more Brultech ECM-1220, ECM-1240, or GEMs (up to ten) and receives energy consumption data via serial ports and/or via TCP (using EtherBees and/or EtherPorts for ECM/GEMs -- and WIFI or ethernet for the GEMs). A total of five serial and/or TCP ports can be used simultaneously. tenBrultechServer then broadcasts the ECM/GEM data to one or more computers on your network. This allows you to run multiple programs that all utilize realtime data from the ECM/GEMs. For instance, tenBrultechServer provides the data to the tenHsBrultech HomeSeer plugin. The Brultech power monitor connects to your electrical panel and continuously measures the amperage and voltage, computing energy consumption. It makes this energy data available to your computer via an RS-232 serial port, or via TCP/IP using the EtherBee EtherPort for ECM/GEMs and WIFI or ethernet for GEMs. The original ECM-1220 can monitor up to two main power lines. The newer ECM-1240 can monitor an additional 5 circuits. The latest GEM model can monitor up to 44 channels. tenBrultechServer automatically adjusts to all models based upon the received data stream. The ECM-1240 can also be set to send the ECM-1220 data format, and the GEM can be set to send ECM-1240 records. tenBrultechServer broadcasts each received packet to all computers on your network. You specify the UDP port(s) to use, and all client programs listen on one of these ports. The data is sent in easily processed Comma Separated Value (CSV) ASCII format. You could have several client programs running on one or more computers using the same ECM/GEM data, such as: A HomeSeer plugin on your HomeSeer server, a data logger that archives all of the power data to a database, a realtime chart running on several panels around your home showing the last 30 minutes of energy consumption, etc.